Thanks to the fast expansion of inflight connectivity, SKYdeals, the first solution of “inflight Shoppertainment” opens the Travel Retail market to short-haul flights. Deployment on Air France short-haul network HOP! 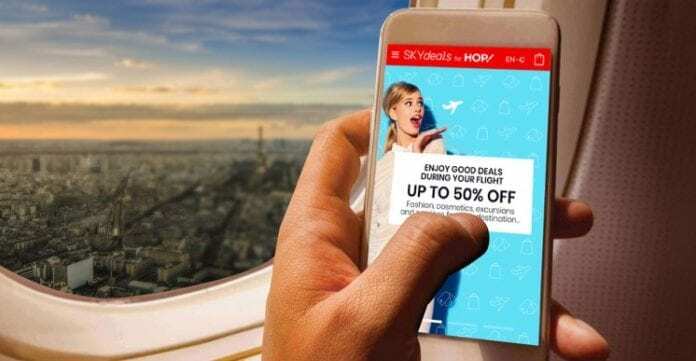 The airline HOP!, Air France short-haul subsidiary, will offer to all its passengers a free access to SKYdeals on laptop, tablet or smartphone. From January 2019, SKYdeals will be deployed on major French lines, connecting Paris-Orly to Bordeaux, Marseille, Montpellier, Nice and Toulouse. SKYdeals is the first marketplace dedicated to passengers connected to the Internet, allowing brands, destination services and duty-free operators to lively promote limited and personalized deals to passengers while they are on board. During the flight, all passengers connected to Wi-Fi will have access to a catalog of last-minute offers on services depending on their destination (activities, entertainment, hotels, airport transfers), as well as a selection of products (cosmetics, fashion, jewelry, decoration, culture) available at preferential rates, up to 50% discount. Orders placed on board will be delivered at home or downloadable with e-coupons for services. As of 2019, a “Click & Collect” service will be available in airport shops or in lockers located in baggage delivery rooms. With its unique inflight shoppertainment features, SKYdeals aims at making shopping entertaining during the whole time of the flight. Passengers will be able to discover Fly over offers, only available when flying over specific areas, auctions sales, group sales and flash sales. The African Tourism Board (ATB) is pleased to announce that Macolline forest in Northeastern Madagascar has joined ATB as a member.